Aged puer tea has greater health benefits and a sweeter taste, so Chinese people like to store some puer tea at home for later use. Our Jia Cang Puer (Home Store Puer) is made in the most popular style for everyday use and for storage. The medium-sized leaves provide for a deep, robust flavor. The color is dark brown with reddish overtones. This tea is both sweet and rich without earthiness. More than one third of Yunnan teas are grown in Xishuangbana, the region where puer tea originated over a thousand years ago. Puer tea was named after Puer City, the city in Xishuangbana where this category of tea was first traded. Our Home Store shu puer tea comes from Xishuangbana, and is fermented in a special process that creates a dark, smooth tea in 60 days, rather than taking years to age properly. This shu puer processing method was developed in the early 1970’s as a quicker alternative to aging sheng puer. Depending on humidity and temperature, sheng puer requires 10 to 20 years of aging to change from a robust, heavy flavor to a smooth and slippery taste. Aged puer tea has greater health benefits and a sweeter taste, so Chinese people like to store some puer tea at home for later use. This shu puer is made in the most popular style for everyday use and for storage. Shu puer used to be more popular in China than sheng puer, used to soothe stomachs during illness or after eating rich foods. Families in China like this grade of puer because it is affordable and very easy to store. It is also popular for its rich taste. The medium-sized leaves provide for a deep, robust flavor. The color is dark brown with shu puer tea’s signature reddish overtones. This tea is both sweet and rich without earthines, making this an affordable option for people who are new to shu puer and want to purchase a smaller amount without investing in a cake. No chemicals were used in the production process for this tea. Tea masters wait for all the mao cha from different regions to be finished processing. All grades of leaves are piled about 80cm high on one side of the factory. About 6-20 tons of tea will be used at a time. The leaves are covered with cotton factory, and sometimes gently sprayed with moisture on the top. The tea will create heat inside, naturally fermenting and growing microbes. Puer factories themselves have rich microbial environments from years of fermenting puer teas. The tea master checks the piles everyday to test the temperature of the tea. Puer factories have their own specific methods of fermentation and cooling down the tea, as to not over-ferment the leaves. Every few days, workers will use large wooden shovels to transfer the tea from one side of the factory to the other. The leaves stick together during the fermentation process and must be separated for even heat. This re-piling process is repeated over and over again until the leaves eventually turn dark brown. This takes approximately 60 days. 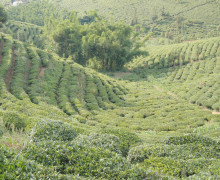 The tea master must really control the temperature and moisture that is given to the leaves, depending on the season. Too much moisture will speed up the fermentation process and result in a strong ocean smell. Many cheap puers on the market are made in about 40-50 days. After fermentation process is finished, all of the leaves are dried in an oven. They are then sorted by a machine to sort out the different grades by leaf size. The smallest leaves are 1st grade and the largest are 10th grade. Puer tea mao cha can be steamed and compressed in to green puer cakes or collected and fermented for a longer to be turned in to black puer tea. Loose mao cha tea leaves are piled together and covered with cotton cloth during the fermentation process. During the fermentation process, the tea will stick together and must be shoveled out to separate it every few days. 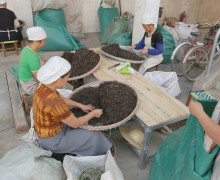 Tea workers sorting out puer tea mao cha to remove twigs and untwisted leaves. Infusion: 1st infusion at least 1 minute. The leaves are good for 6 infusions.